I created this card for KSS Crew Member Dee Jackson, as a Birthday/Get Well card, I thought it might cheer her up. Instead of using my SU inks, I thought I'd try Ranger Distress Inks for a bit of a softer look. I used the Stamps and Smiles sketch found here as the inspiration for my layout, extending the rectangle panel to fit my image. The panel under my Hydrangea is a piece of Amethyst done with the Torn Frames Technique from a past TJNL. To create the circles, I used my Nesties Circles and Scallops, and ran the Lilac Panel through my Big Shot using the Distressed Stripes CuttleBug Folder. Now for the savings I mentioned, you can save 10% at Kitchen Sink Stamps when you use discount code LISA10KSS. Note this code is good on everything in the Kitchen Sink Store, and does not expire. Happy shopping! Off to iron my son's dress clothes for the 8th grade dance! Have a great weekend! 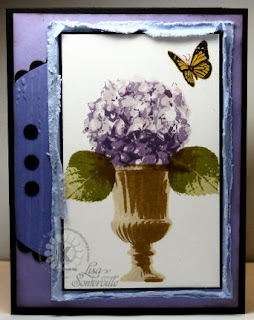 The hydrangea image looks so pretty in the distressed inks. I love the hydrangea card, its so beautiful!! !